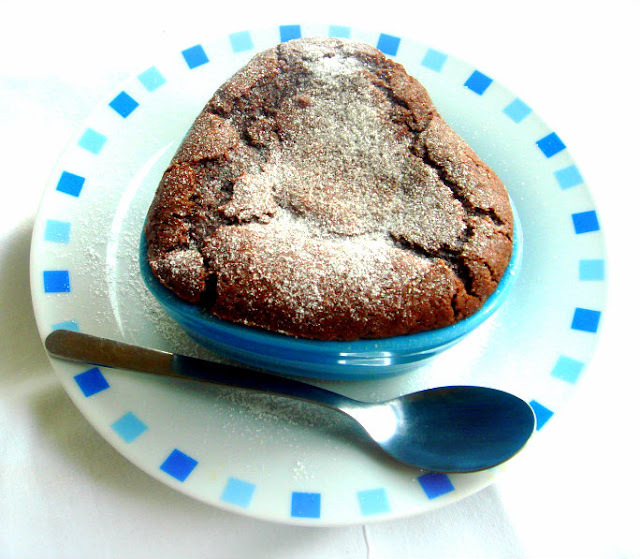 Molten lava cake are always baked as single serving cake in ramekins and they have four main ingredients.Molten lava cake is quite a popular dessert, for our this month's Baking Eggless we have to bake an eggless molten lava cake. This month's challenge recipe was suggested by Sowmya of Nivedhanam. Eggless molten lava cake was quite tricky than the usual lava cake with eggs, i tried the recipe suggested by Sowmya but the first try didnt turned out good,fortunately i tried with less quantity. For the second try, i tried adding the equal amount of chocolate,butter,condensed milk. 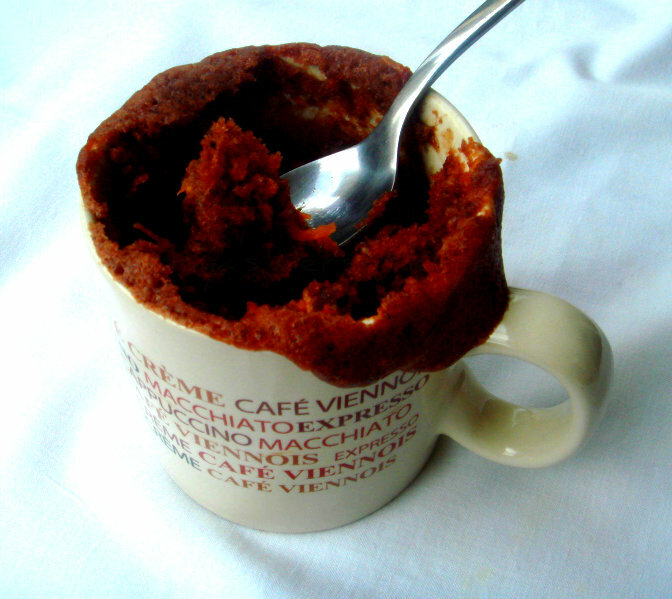 This time eggless molten lava cake turned out prefectly. I prepared 5 ramekins of this cake, but they vanished very quickly and i just struggled to click this picture as my lil one started screaming to have the cake. I couldnt even transfer this cake to a serving plate as my lil one finished already half of the cake.Since lava cake should be cooked like cake and while having the melted chocolate will oozes out when you cut the center of the cake, i added a chocolate pieces in each ramekins.I'll be making some soon again,as this eggless lava cake is a big hit at home among my kids.Sending to 60days of Christmas hosted by Priya and Divya. Sieve the flour with baking powder and baking soda,keep aside. Melt the chocolate with butter in microwave oven for 2minutes.Add the sweetened condensed milk,to the melted chocolate, mix well. Finally add the flour and mix well. Fill the well greased ramekins with enough batter, drop a chocolate chunk to the center of the ramekin, take care to cover well the chocolate chunk. Bake for 15minutes in middle rack.Let the ramekins sit for 5minutes. Invert the cake to a plate. Waffles with nutella,who can resist to this beautiful pair. For our weekend breakfast, i quickly prepared this catchy pumpkin barley waffle and my kids enjoyed thoroughly. Usually i'll go for eggfree waffles, but this time these waffles have eggs in it, if you want to skip it you replace it very well with applesauce. 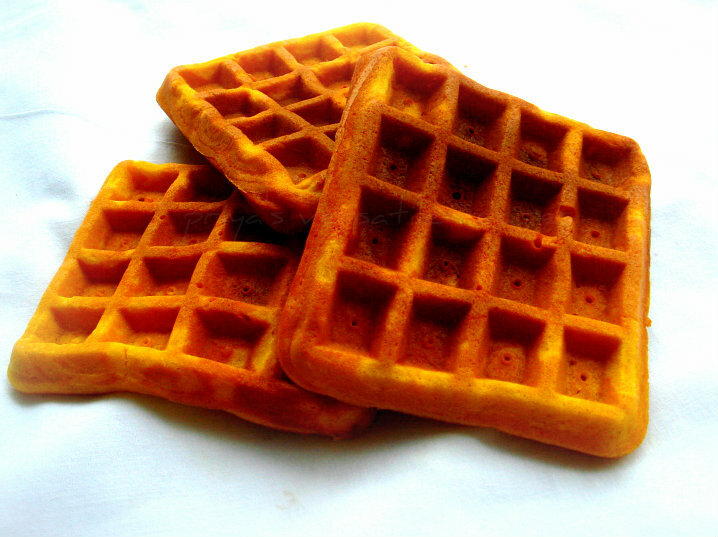 You can check my eggfree sugarfree barley waffles to get an idea about eggless waffles. With a cup of coffee or a bowl of warm milk, these waffles goes awesome and you will have a super filling,healthy breakfast.Sending to my own event CWS-Barley guest hosted by Roshni and to my event Healthy Diet-Fast & Quick Healthy Dish guest hosted by Kalpana. Sieve together the flours and baking powder, beat together the eggs,sugar,pumpkin puree,vanilla extract,oil and milk, gradually add the wet ingredients to the dry ingredients and turn as a batter. Pour a ladle of batter to the waffle maker until they get cooked.. Serve with a cup of warm milk with nutella spread,jams or simply with maple or agave syrup. Guest posting, love the friendship behind this. This baath cake is my 8th guest post i prepared specially for one of my blogger buddy aka one of my virtual sister Priya of Cook Like Priya. Christmas is one of the festival we never failed to celebrate here, the chilled weather of december gives a wonderful festive mood and every year we wait eagerly for this festival. When Priya asked me something christmassy, initially i want to make a christmas special bread from Europe. 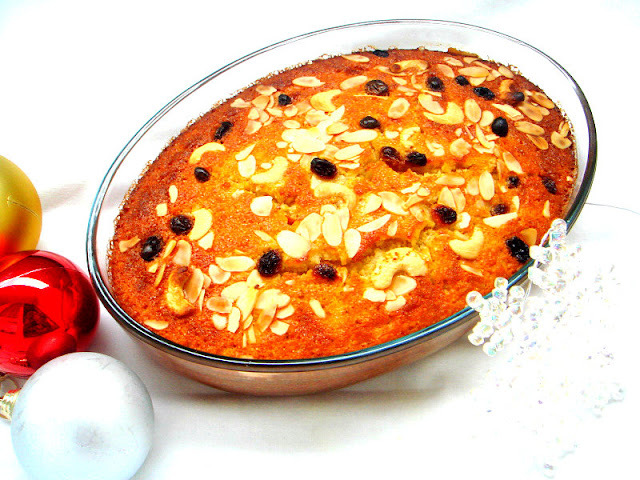 Finally after many hesitation,i went for an Indian christmas cake.I usually bake the famous plum cake,somehow i dont want to reproduce the same for this guest post. 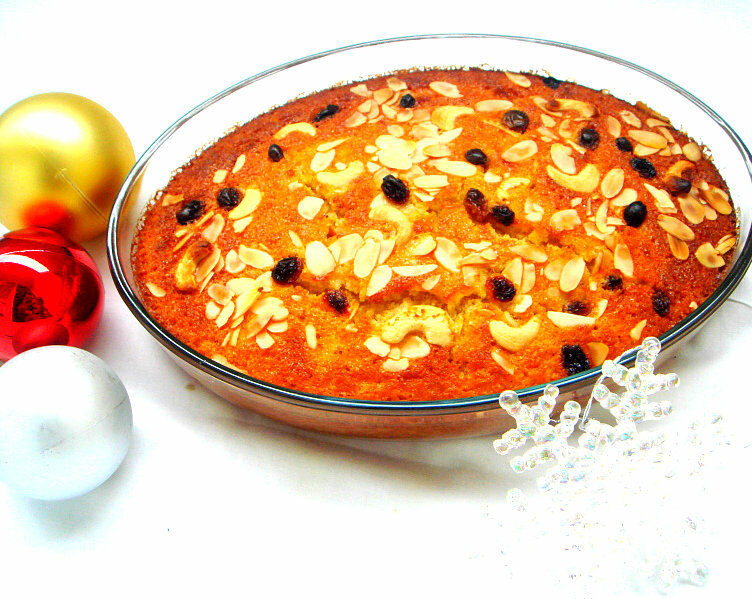 I know Goan makes many traditional christmas special bakes every year and Baath cake is among them. Coming to this Baath cake,this cake is prepared with freshly grated coconut and semolina, with less butter this cake goes for an easy breezy preparation. 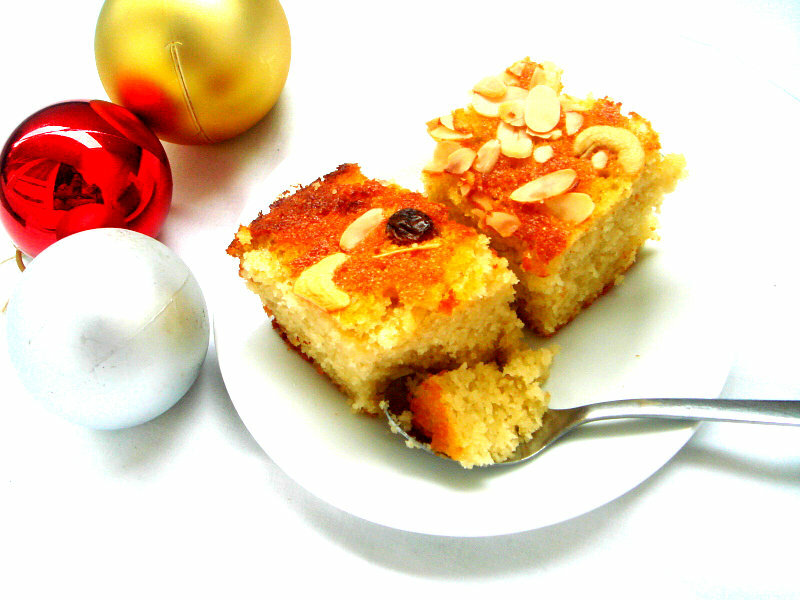 With a wonderful texture,this cake tastes fabulous and melt in mouth.Goans prepared this cake traditionally in clay oven for every christmas and definitely this cake have its own place in every home during christmas. Even blogging is a virtual world, am blessed to get a decent number of wonderful friends.I can say that Priya R of Cook Like Priya is one among them, she is a very friendly food blogger, fabulous photographer. I started chitchatting with her after we joined a monthly baking event.She shares wonderful traditional dishes to mindblowing bakes with her own touch,eventhough i have numerous favourites in her space my recent favourite post of her is this Choco Beet Cake. Beat the eggs till they turns fluffy and add the butter to it,beat again for few minutes. 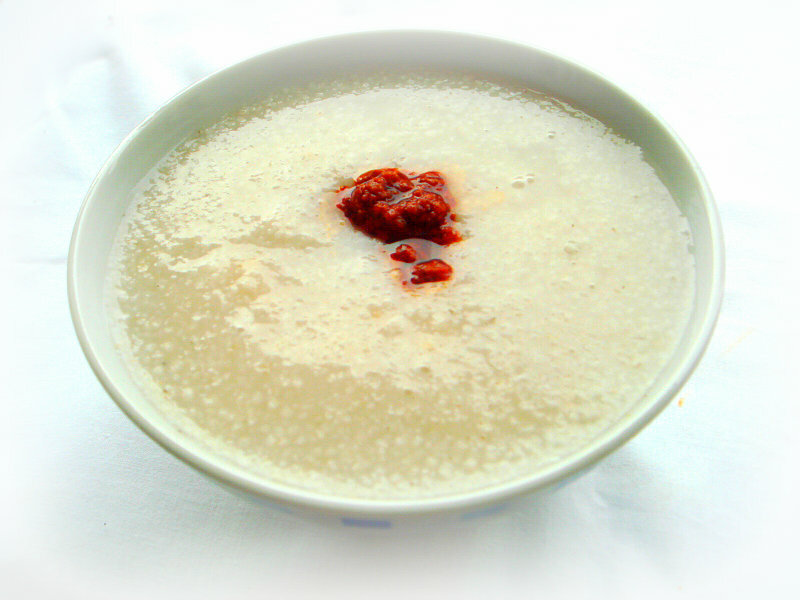 Grind the grated coconut with warm water to make a thick coarse paste. In an another bowl, take the semolina,all purpose flour,baking powder,cornflour,salt and sugar and mix well. Now add the grounded coarse coconut paste,beaten eggs gradually to the dry ingredients.Mix everything well with a spatula. Cover it and keep the above mixture for 8 hours in room temperature (if the climate is chilled) or over night for best results. If the climate is hot, cover this cake batter and keep in fridge for 8 hours or overnight, remove an hour earlier to bring it at room temperature before baking. Finally add the vanilla essence and give a stir. Preheat the oven to 170C. Transfer the cake batter to a well greased round or square mold. Top it with dry fruits. Bake for 30-35 minutes until a skewer inserted comes out clean. Your Baath Cake is ready. If you want something different for your christmas celebration this year, dont hesitate a second to give a try to this fabulous cake. 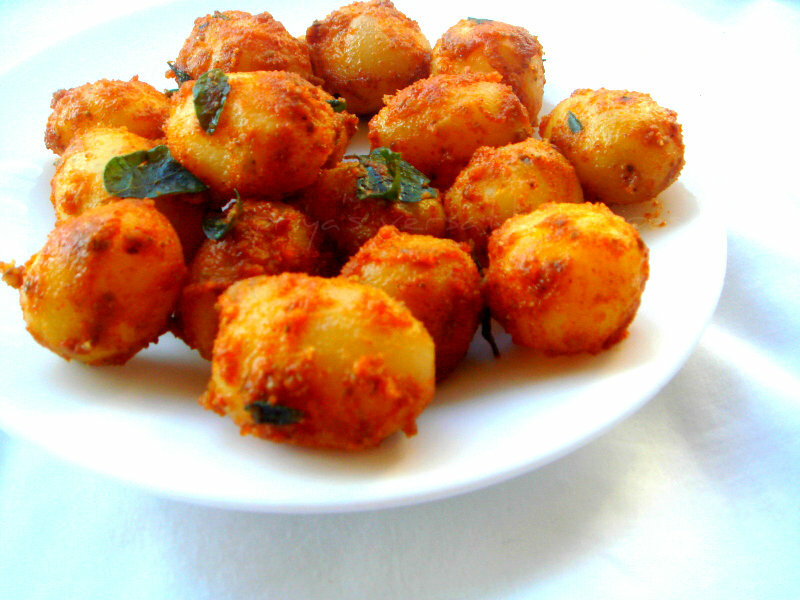 Usually chilly idlies are prepared with leftover idlies,i prepare my idly batter once a week. Obviously we always have leftover idlies at home. Sometimes i finish them as upma or else i'll reheat it and have with any chutneys.For the third day of blogging marathon, i combined leftover mini idlies with leftover cooked chickpeas for making this chilly idly, both together turned out dinner simply awesome. For my surprise even my daughter who hates idlies enjoyed thoroughly and everyone at home loved it.This chilly idly goes for a easy breezy preparation,you can add very much any sort of veggies but i just went for cubed green bellpeppers and chickpeas.Since i had mini idlies, i added them directly to make this dish, in case if you have usual idly, just cut them as small cubes and make out this dish.Sending this rice to my event Healthy Diet-Fast & Quick Healthy Dish guest hosted by Kalpana.Check out the marathoners running this 22nd edition of blogging marathon here. Heat oil, add the sliced onions,ginger garlic paste and saute until the onions turns transculent. Add now the cubed bellpeppers, saute for few minutes. Add the mini idlies,chickpeas, saute for few minutes. Finally add the ketchup,soya sauce,chilly sauce and garam masala,cook until the idlies gets well coated. 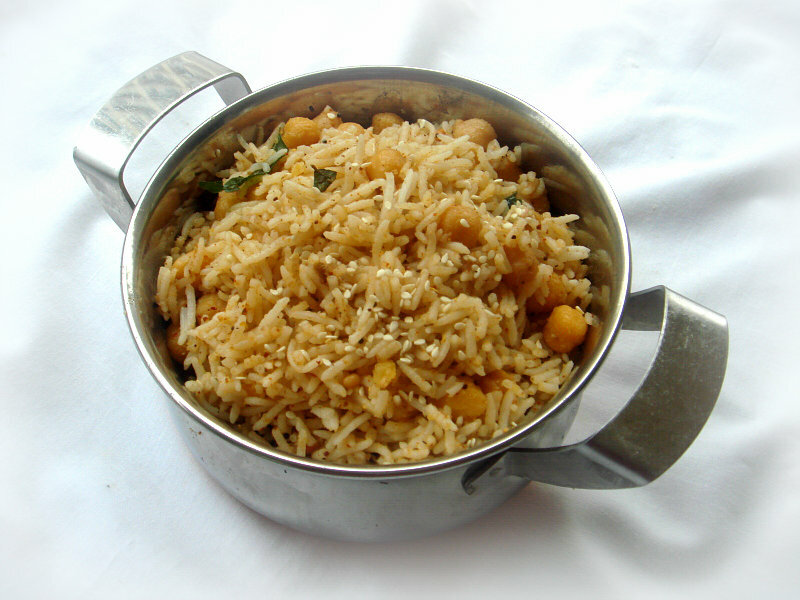 For my second day of blogging marathon with cooking with chickpeas as theme, i choosed to make something different with rice. Usually i make atleast once a month our favourite flavourful,healthy sesame rice. Sesame rice gets ready very quickly when compared to any other one pot meal. This rice goes for a quick spice powder with dry roasted sesame seeds along with some spices mixed with rice and tempered with spices. This time for a change, i tried adding cooked chickpeas to my usual sesame rice, for my surprise this combination rocks.I simply served this rice with fried potatoes and both this flavourful rice and spice potato fries turned out our yesterday's lunch simply awesome. Next time,if you are making sesame rice at home,do try adding few chickpeas and you will definitely know the difference.Sending this rice to my event Healthy Diet-Fast & Quick Healthy Dish guest hosted by Kalpana.Check out the marathoners running this 22nd edition of blogging marathon here. Dry roast sesame seeds in simmer until they turn golden brown. In tha same pan dry roast the dry chillies then followed by coriander seeds and urad dal..keep aside and let them get cool. Grind as fine or coarse powder with enough salt and store them in a air tightened box..
Add this spice powder to the cooked rice as much as you desire. Meanwhile heat the oil and fry the mustard seeds,urad dal, dry chillies and curry leaves,finally add the chickpeas and cook for few seconds. Add immediately this tempered spices to the rice and toss gently until the rice get well mixed,add salt if needed.. Enjoy this dish with potato fries. 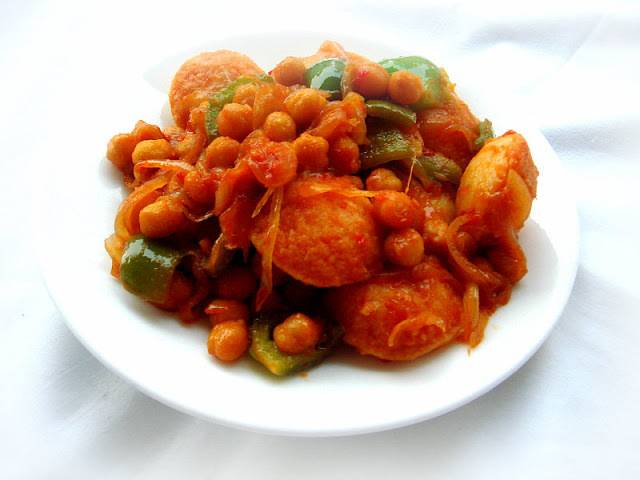 Here we go for a week of blogging marathon, this week's theme is going to be Cooking with chickpeas. Obviously my next three dishes are going to be chickpeas based dishes. For today's post, am posting this thick chickpeas and eggplant dal based curry, this dish hardly needs less than 15minutes and this dal goes for a quick preparation. 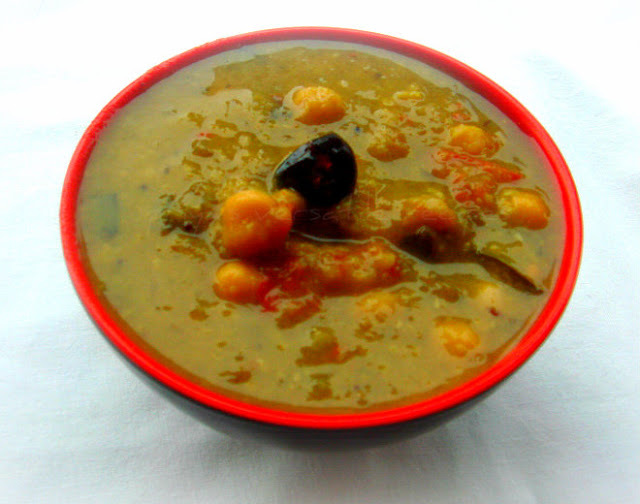 This curry goes for pressure cooking and few roasted spices with eggplant and cooked chickpeas. This dal goes awesome with anything, we call it as three in one dal, coz you can serve this delicious dal with idlies or dosas for breakfast, with rice for lunch and with rotis for dinner.Usually i make this dal quite often just with eggplants,for a change i tried this time with chickpeas and both works out wonder. Take the washed moongdal,cubed eggplants, half cup of chickpeas,chopped onions,chopped tomatoes,slit opened green chillies with turmeric powder,salt and enough water in pressure cooker. Close the cooker with lid and pressure cook for 3 whistles. Meanwhile dry roast the ingredients under the list 'to roast & grind' as fine powder. Once the steam gets released, smash the cooked veggies and chickpeas with a spatula. Now add the grounded roasted spice powder,remaining chickpeas to the dal and cook everything in simmer. Adjust the thickness of the dal with enough water. Finally heat the oil, lets splutter the mustard seeds,urad dal, add the dry red chillies,curry leaves and fry them. Add this tempered spices,lemon juice to the dal and give a stir. 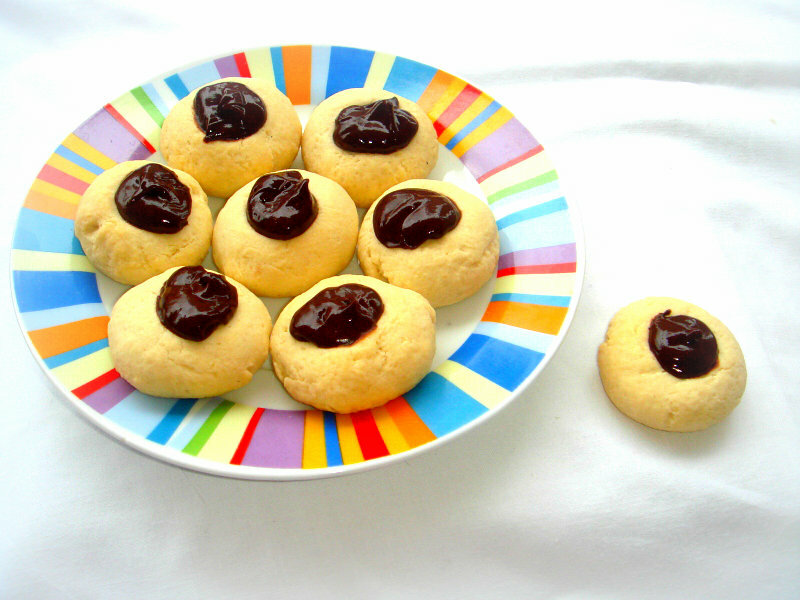 I have already posted a super attractive thumbprint cookies with custard powder,everyone at home enjoyed thoroughly those cuties, from that day my lil one started asking me to make again with chocolate. This weekend,he bugged me very much and finally i finished making some with an easy chocolate sauce,you can replace very well this chocolate sauce with nutella spread. Since i ran out of the nutella, i prepared quickly a ganache like chocolate sauce. These cookies are big hit at home again and we couldnt stop munching these beauties.These attractive cookies tastes absolutely incredible,quite addictive,super buttery and definitely a kid pleaser. As usual i prepared my thumbprint cookies as eggless version,if you dont like chocolate filled cookies, you can go very well for any kind of jams. Whisk the butter,confectioner's sugar together until they turns creamy, add immediately the flour,vanilla extract ,milk and gently mix until they forms as a soft dough. Meanwhile heat the chopped dark chocolate chunks,butter and cream in microwave oven for 2 minutes,whisk it well to make a thick chocolate sauce. Once the cookies gets cooled, fill the cookies with the prepared chocolate sauce. 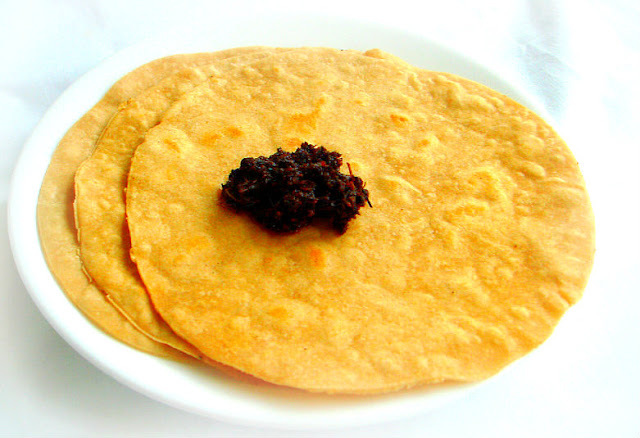 As i prepared myself barley flour at home,i tried adding them while preparing our favourite chappathis two days back. They came out extremely soft, since i love to make chappathis quite often, i do experiment with many different types of flours. 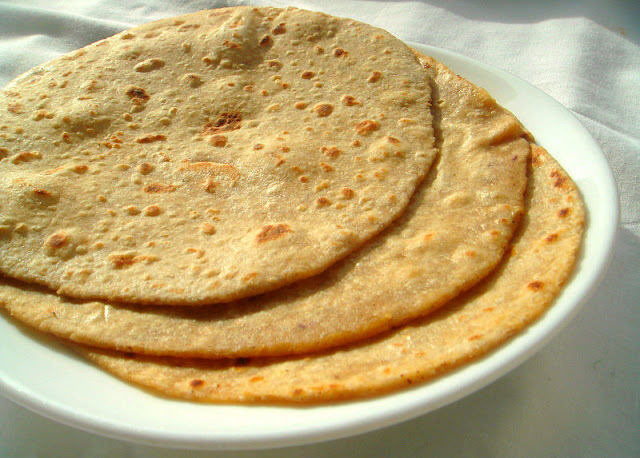 But somehow after oats flour,i loved this barley and wheat flour combo in chappathi. I went for equal cups of both barley and wheat flour for making these chappathis. You can spice up this chappathi with your favourite spices and i spiced mine with some crushed ajwain aka omam seeds, they gives a wonderful flavour to this simple healthy chappathi.Enjoyed thoroughly our dinner with this chappathi served along with vegetable kurma. .You can even freeze these chappathis for later use and they will stay prefect for months.This will be definitely handy when you are in hurry.Sending to my own event CWS-Barley guest hosted by Roshni. Take the wheat flour,barley flour,ajwain seeds with salt in a large bowl,gradually add the water and knead as smooth and soft dough. Keep aside half an hour, make medium sized balls from the dough,dust with flour and roll them as rotis. Meanwhile heat a tawa, drop gently the rolled roti,drizzle few drops of oil,cook on both sides until they gets well cooked. Enjoy warm with any sort of chutneys. If you like to have a bowl of super filling healthy porridge for your breakfast like me, this quick and super healthy barley porridge is for you. Actually i prepared this healthy, filling breakfast porridge with homemade barley rava and went for pressure cooking. Needless to say that this porridge takes hardly less than 15minutes to get ready and i enjoyed thoroughly with some spicy mango thokku for my today's breakfast. A quick breakfast to kick start your day. For making barley rava, just dry roast the pearl barleys and grind it for few minutes, sieve it to get the flour and the barley rava separately.Store the barley rava and flour separately in an air tight boxes and use it as per need.This barley rava is quite handy for making this kind of wholesome foods.If you are bored of usual oats porridge, give a try to this porridge and am sure you will definitely enjoy this healthy food.Sending to my own event CWS-Barley guest hosted by Roshni and to my another event Healthy Diet-Fast & Quick Healthy Dish guest hosted by Kalpana. 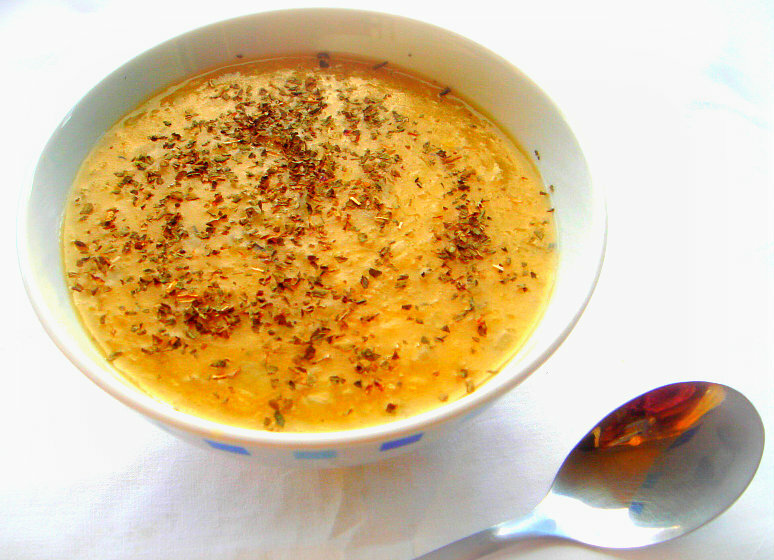 In a pressure cooker, take the barley rava, water and salt, pressure cook for two or three whistles. Once the steam gets released, finally add the milk to the porridge and stir it. Serve hot with your favourite thokku or pickle. An easy breezy upma,gets ready with less than 15minutes. I prepared quickly this upma yesterday for our dinner as i felt really lazy to make something else. 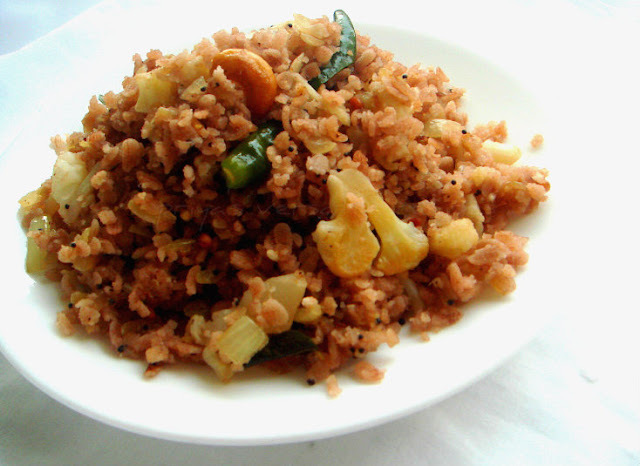 Just added some leftover finely chopped cauliflower florets to make this quick upma more healthier. You can skip cauliflower and add your favourite veggies here. Serve this upma simply with a coconut chutney, both together turns your dinner simply filling.You can also prepare this quick and healthy upma even for your breakfast as it goes for a simple and easy preparation. Dont worry if you dont have red rice flakes,make it with usual rice flakes. 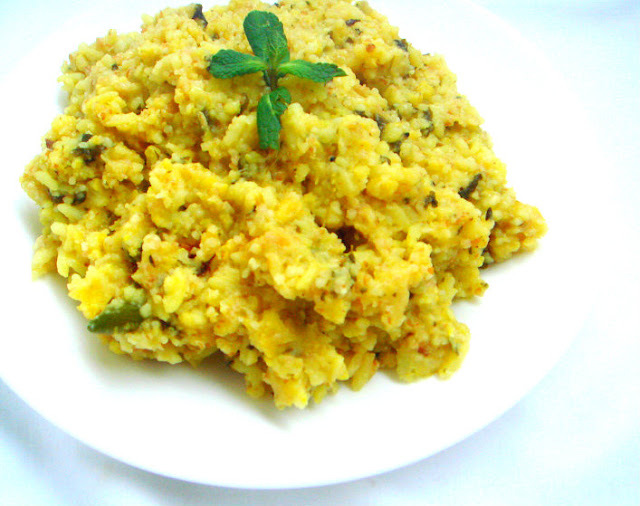 Sending this healthy upma to my event Healthy Diet-Fast & Quick Healthy Dish guest hosted by Kalpana. Heat enough oil, let splutters mustard seeds, urad dal,channadal. Fry the cashew nuts,dry red chillies,curry leaves, add immediately the chopped onions, chopped green chilies and cook until the onions turns transculent..
Now add the chopped cauliflower, saute them for few seconds. Finally add the salt, the already washed red rice flakes. 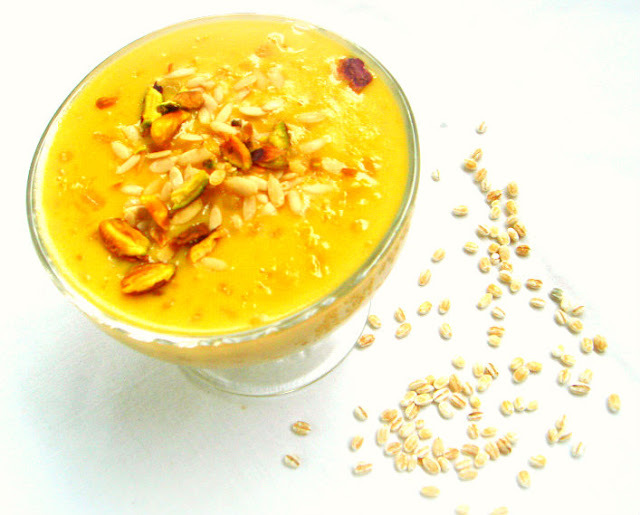 If you never tried making kheer with barley, you are missing something super delicious and definitely a healthy kheer. I tried making this kheer during this weekend as my daughter asked me to make some kheer,yep she just love this milk based sweet. Since i used pressure cooker for making this barley kheer, this sweet dish gets ready in very less time than the usual stove topped ones. This delicious,rich looking kheer with few saffron strands and sweetened condensed milk tastes simply awesome and everyone enjoyed thoroughly this kheer. As i choosed pressure cooked recipes for this week's blogging marathon,this kheer suits absolutely prefect for my theme. Check out the marathoners running this 22nd edition of blogging marathon here.Sending to my own event CWS-Barley guest hosted by Roshni and to my another event Healthy Diet-Fast & Quick Healthy Dish guest hosted by Kalpana and to 60days of Christmas hosted by Priya and Divya. Pressure cook the pearl barley with a cup of water for 5-6whistles. Once the steam gets released, add the milk,sweetened condensed milk,saffron strands and cook everything in simmer for few minutes or until the kheer turns bit thick. Finally add the cardamom powder,give a stir and put off the stove. 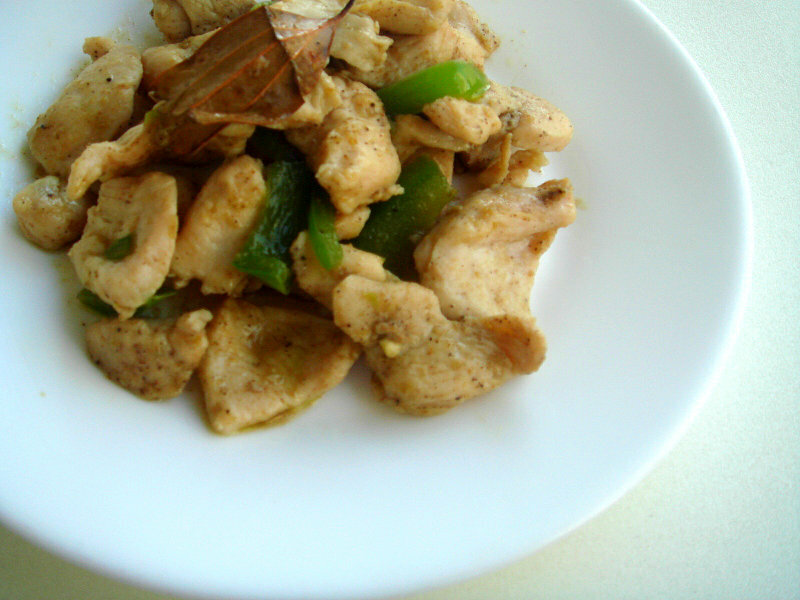 Serve warm with chopped nuts. I can call this sambhar as bachelor's sambhar, yep this dish is really very quick to make and definitely an easy breezy dish, gets ready in very less time. Just you need a pressure cooker, this is a pressure cooker sambhar. I do this sambhar quite often if i have sudden guests at home or else whenever i feel like lazy.This sambhar dont even need onions or garlic, so you can have this gravy for a fasting day. Coming to this sambhar, i used mixed dals and variety of veggies, just put everything together which goes for pressure cooking which i spiced up with sambhar powder, tempered spices and lemon juice. Whenever i go to farmer's market, back home i usually prepare my frozen veggies either by slicing or chopping them, as they are really handy for making quick foods,also they wont lose their vitamins once they get freezed. If you have frozen veggies,this sambhar is super easy to make. For my second day of blogging marathon, am posting this quick sambhar as i chosed pressure cooked recipes as this week's theme. Check out the marathoners running this 22nd edition of blogging marathon here.Sending to my event Healthy Diet-Fast & Quick Healthy Dish guest hosted by Kalpana. Wash the dals together, transfer it to the pressure cooker. Add the mixed veggies,tomato,sambhar powder,chilly powder, turmeric powder and salt to the dals, add 3cups of water and pressure cook it for 3whistles. 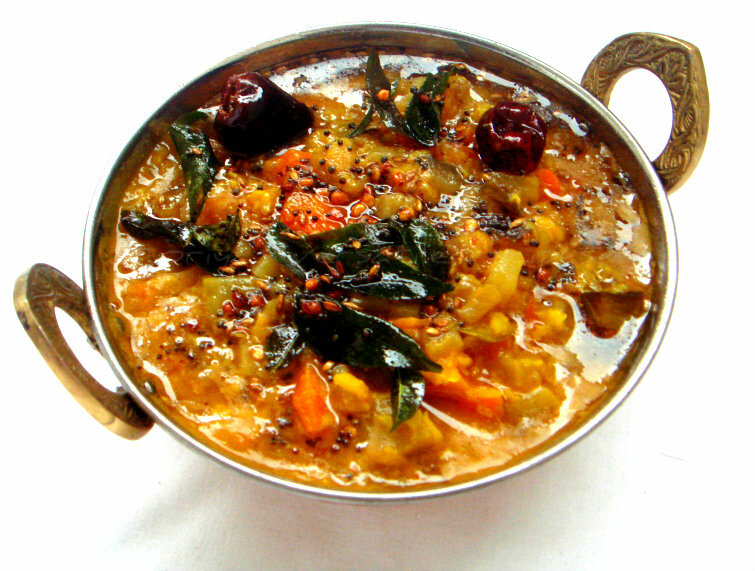 Once the steam get released, mash slightly the prepared sambhar with a spoon and keep aside. Meanwhile,heat enough oil in a pan, let splutters the mustard seeds,urad dal,cumin seeds and asafoetida powder, add the dry red chillies and curry leaves. Fry it until they turns brown. Add this tempered spices,lemon juice to the sambhar,give a stir. We are having a nasty chilled weather, i dont felt like cooking for hours in kitchen as the climate keeps me super lazy. This week, am running my third week of blogging marathon with pressure cooked recipes as theme, i cant live without pressure cooker. They makes really our lives easier and anything cooked with them goes hardly for less time when compared with the dishes cooked in pans or in kadais. Srivalli proposed to cook three different dishes for this three days of blogging marathon, i choosed one pot meal,gravy and an Indian sweet cooked with pressure cooker for this week. Obviously my first dish for this week blogging marathon goes for a hearty and healthy one pot meal with mixed grains, drumstick leaves and mixed dals. This dish will definitely goes for quick cooking and you can enjoy this food anytime of the day served simply with papads, potato chips or else pickles.I used homemade barley rava, foxtail millet, brown rice,wheat rava,quinoa and rolled oats with toor dal,masoor dal and moong dal along with fresh drumstick leaves. You can also add veggies in this healthy food or else any other greens as you prefer. Wash and soak the grains and dals together for 15minutes in 4 cups of water and keep aside. Take now the soaked grains and dals with drumstick leaves, turmeric powder,sambar powder,salt in pressure cooker along with their soaked water,close the cooker with the lid and pressure cook upto 3 whistles. Meanwhile heat the ghee or oil in a pan, fry the mustard seeds,urad dal,cumin seeds,dry red chillies,slit oepend green chillies and asafoetida powder, add the curry leaves, fry for few minutes. Once the steam gets off, open the lid and add this tempered spices and ghee, give a stir and finally add the chopped coriander leaves and lemon juice. Our this month's Baking Partners challenge was to make either dinner rolls with eggs or eggless dinner rolls. 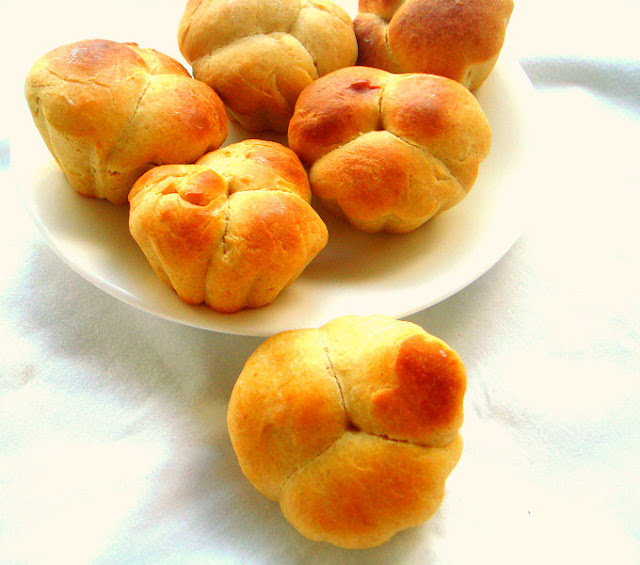 Swathi of Zesty South Indian Kitchen,the brain child of this monthly baking event shared us 7types of dinner roll shapes and asked us to try atleast 3 among them. I chosed to make both eggless and rolls with eggs for this month's challenge. I tried the small braid rolls with eggs while for eggless version i went for clove leaf rolls and lion house rolls. I followed exactly as the original recipe of dinner rolls with egg which Swathi send to us through mail,but i made a small change in the eggless version dinner rolls ingredients, the original recipe without egg had potato starch or cooked potato since i dont want use it, i skipped it and went for custard powder. Addition of custard powder gives a wonderful colour to my eggless dinner rolls and tastewise we didnt found anything different,my kids just enjoyed thoroughly when i served these dinner rolls along with cream cheese and a bowl of warm soup.However i enjoyed thoroughly this challenge as i like to play with yeast. Mix the water,milk powder together until the milk powder get dissolves. Add the yeast to the mixture,then add the sugar,salt,butter,egg and the flour, mix everything and knead for a while, its will be sticky. Now add the 2more cups of flour and knead for another few minutes to get a stiff dough. Finally add a cup of flour and knead again, the dough will be soft and not too sticky. Transfer this dough to a greased bowl and keep in warm place for 2hours until they double their size. Sprinkle the counter with a flour and put the dough on the flour. Flatten the dough as rectangular disc, cut small rectangular disc from the rolled disc. Make three slits to the small rectangular disc without disturbing the top of the disc, make the braid as show in the video. Once the braid is ready, keep it again in warm place. Preheat the oven to 350F and brush the small braid rolls with egg yolk and bake for 20-25minutes until the crust turns brown. Take the flour,salt,sugar,yeast,custard powder and butter in a bowl.. Mix everything well,now add the lukewarm milk and knead everything as a soft dough, again knead to dough for few more minutes until they turns elastic. Keep in a warm place until they double their size. Punch the dough and prepare rolls with the shapes as you desire. Simply roll the dough and pinch down three small balls from dough,place them to a muffin mould and keep aside to double their size,this is clove leaf roll. 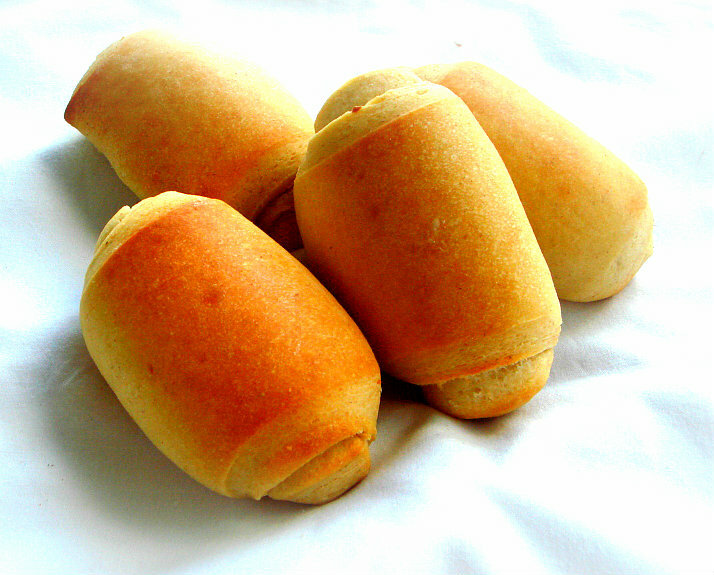 Roll the remaining dough as a rectangular disc, cut it in the middle and cut them as small sized rectangular disc, and roll over them, arrange in a greased plate to rise until they double their volume, this is lion house rolls. 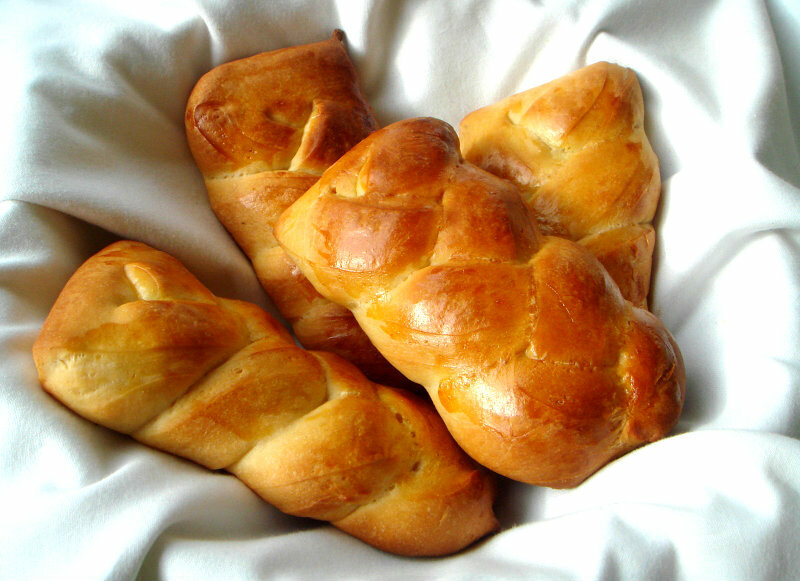 Preheat the oven to 350F, mix the milk and sugar for brushing and brush the dinner rolls on the top. Bake for 20-25minutes or until the turn turns golden brown. Let them cool completely and enjoy with your favourite spread. Wishing my readers and my blogger buddies a happy and safe diwali. Every year even many miles separate us from India, we still manage ourselves to celebrate this beautiful diwali festival with our friends and relative, but unfortunately this time its a working day and so its quite dull here. Wish very soon Diwali will be considered as a important festival and i want the french government to declare its a government holiday, i know it will happens only in my dream.Also am very happy to say that this post is my 2,250th post,thanks to each and every readers for making this, nothing is possible without all your encouraging words. Coming to this barley murukku, this time i just prepared this murukku along with garlic moongdal murukku, check out my guest post at Swasthi's Blog. I never thought that barley flour will works wonder for making these crispy beauties,since its my first time to make savouries with homemade barley flour, i wasnt that much sure about the final result. But for my surprise, they turned out simply mindblowing.For making barley flour yourself at home, just roast a cup of pearl barley, grind it once its get cool with a mixer and sieve it to get the barley rava and barley flour, conserve them in air tight box for further use. No need to search in your Indian stores for barley flour, i'll advice to make yourselves this kind of flours at home itself with minimum efforts.Sending to my own event CWS-Barley guest hosted by Roshni. Take the rice flour,barley flour,roasted gram flour,butter,cumin seeds,asafoetida powder,salt and ajwain seeds in a large bowl. Gradually add the water and knead everything as a soft and stiff dough. Heat the oil for deepfrying in a kadai. 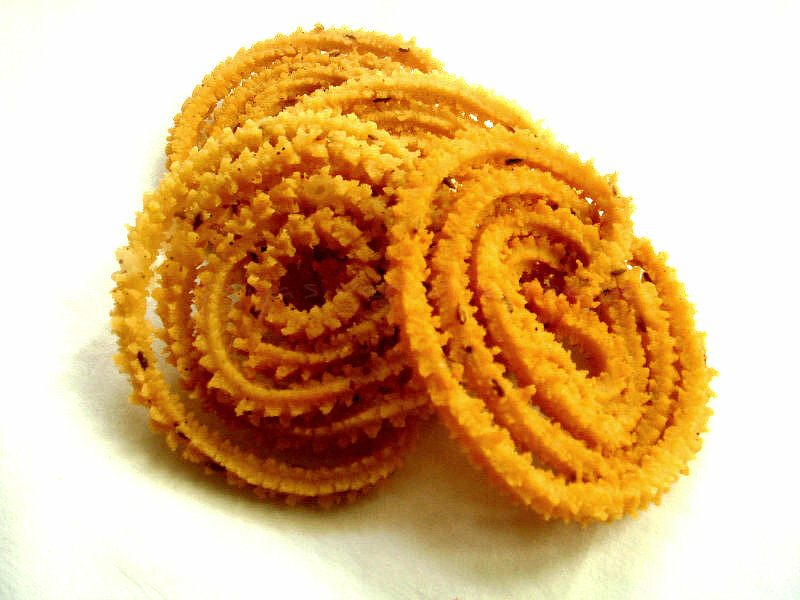 Take a murukku press with star nozzle,pinch a small portion of the dough,drop it into the press and squeeze out as round shaped murukku in a greased flat plate. Once the oil is hot, add the squeezed murukku. Fry on both sides until its golden brown drain the excess of oil with paper towel. Repeat the same process until the dough gets finished. 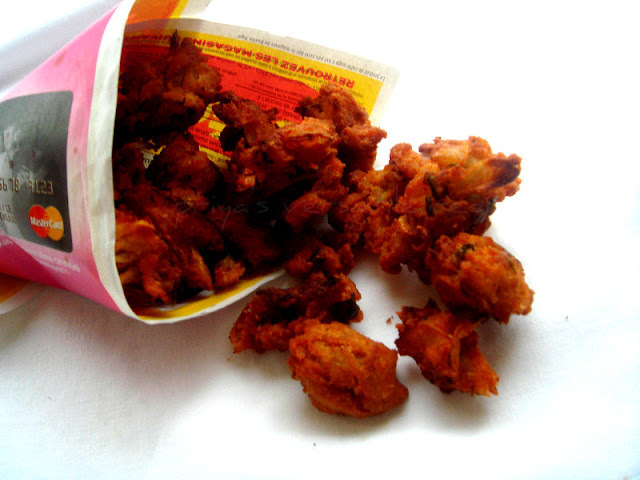 Fry the murukkus in small batches. Arrange in an air tight containers and enjoy. Khara boondhi, after crunchy munchy murukkus these tiny pearls with gtam flour is one of my most favourite. When i was kid, my mom used to make specially for me some spicy boondhis while she was preparing laddoos. I love it that much, but i didnt prepared them since a long as i dont have the special ladle for making these boondhis, finally i prepared some two days back with a stainless steel strainer i bought during my last trip to India.They came out extremely crispy and with some cashew nuts and peanuts fried along with few curry leaves turned this crispy boondhi more tasty and flavourful. Boondhis are quite easier when compared to other Indian savouries, but the consistency of the batter is very important to get them prefectly. My next trip to India already have a long list and definitely i wont come back here without the boondhi ladle. This is my third post for this week's blogging marathon under the theme 'Diwali special', hope you guys enjoyed my three day's diwali special dishes, do check out the marathoners running this 22nd edition of blogging marathon here. Mix the gram flour,rice flour,salt,baking soda and chilly powder together in a vessel with enough water to make a thick batter without any lumps (the batter should be like the idli batter). Heat the oil for deep frying, once the oil gets hot add the cashew nuts and fry until they turns brown, remove it and add the peanuts to the oil and fry until they turns brown. To the same oil, fry the crushed garlic cloves and curry leaves together until they turns crisp and remove it from the oil, take all these fried ingredients in a large vessel. Now with the boondhi ladle or a ladle with small round holes, rub the batter with an another ladle so that the batter will fall through the holes evenly. Fry until it turns crispy, remove it with a slotted spoon,drain the excess of oil with a paper towel and finish the remaining batter with the same process. Now add the chilly powder to the boondhis, fried cashews,fried garlic,fried peanuts and curry leaves, toss it gently and store in air tight box. For my second day of blogging marathon with diwali special as theme, i decided to make some laddoos with lotus seeds aka makhana. I grabbed a packet of this lotus seeds during my last trip to India, back home i stored them in air tight box and making out dishes with them very rarely,coz these lotus seeds are like treasure for me. We dont get this wonderful seeds here, so obviously i take more care while using these seeds as i dont want to waste them. For diwali, i quickly prepared this delicious makhana laddoos with yellow cornmeal, this laddoos is definitely one of the easy breezy,quick and healthy balls.These laddoos stays prefect for a week in room temperature and instead of ghee i used milk for rolling this laddoos. 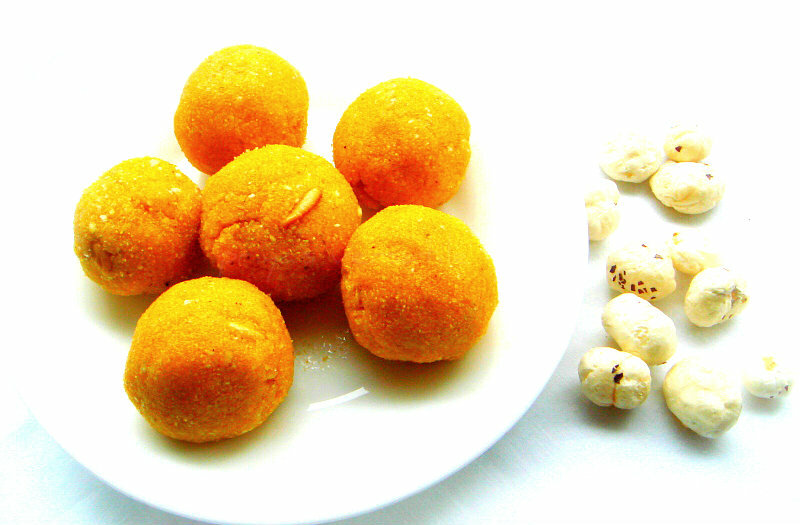 Give a try friends, if you get lotus seeds easily this laddoos will definitely satisy your sweet tooth.Check out the marathoners running this 22nd edition of blogging marathon here.Sending to 60days of Christmas hosted by Priya and Divya. 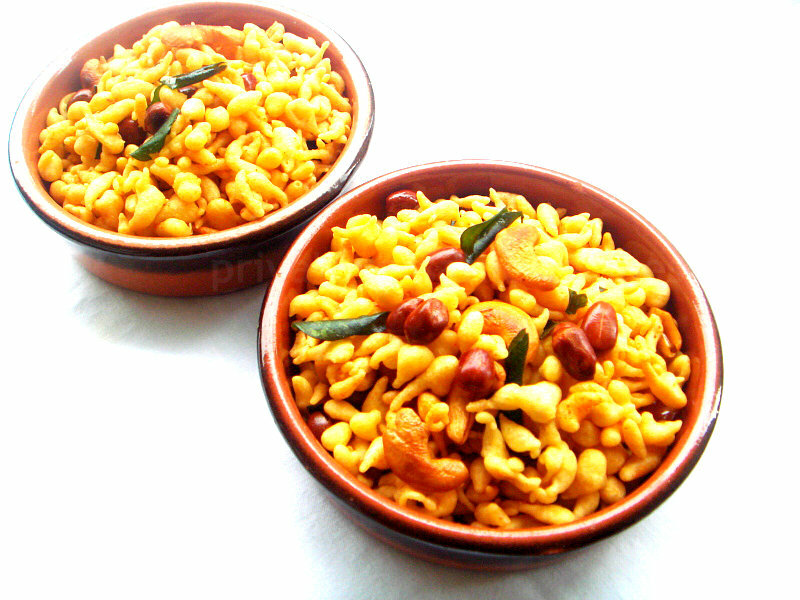 Heat a tablespoon of ghee and fry the broken cashews until they turns brown. Take off the fried cashews and roast the cornmeal in the same pan for few minutes. Transfer the cornmeal to a plate, heat the remaining ghee,fry the lotus seeds until they turns bit crisp. Now take the roasted cornmeal,roasted lotus seeds,sugar in a mixer and grind everything as bit coarse powder. Take the coarse powder,fried cashews in a plate,springle enough milk and make out small balls from the mixture. 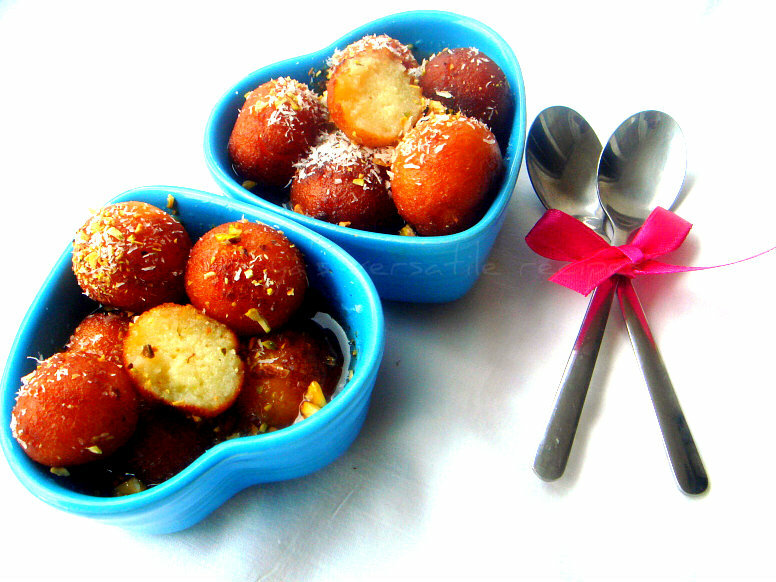 You can also use ghee while making this laddoos.Store in air tight containers. We are starting our second week of blogging marathon this week,my theme for this week is Diwali special, since diwali is next tuesday, everyone will be very much busy with shopping and diwali sweets and savouries making.Coming to my today's achu murukku aka achappam is a quite popular crispy sweet of Tamil Nadu and Kerala, they are well known as achu muruku in Tamilnadu,while Keralites call it as achappam.Its a sweet deep fried beauties,prepared with usually with maida,riceflour and eggs with sugar. These beauties will have their own unique taste with less sweet. 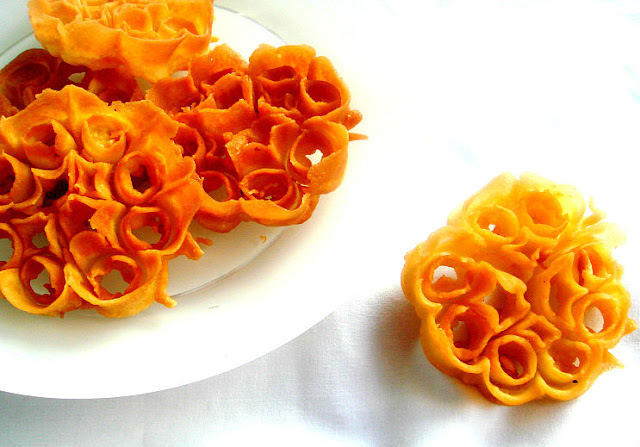 Anyone will love this crispies, i prepared my achu murukkus without eggs and they came out extremely prefect. Everyone at home enjoyed these deep fried cookies when i asked them to taste it, also am trying for the first time this fabulous achu murukkus for diwali. 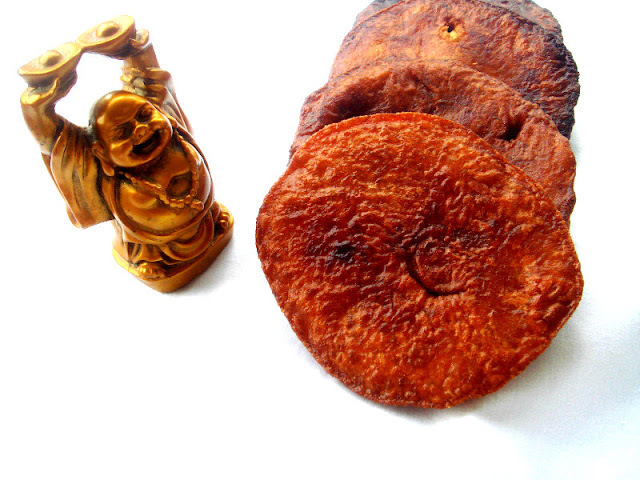 Last time when i went to India, i bought this murukku's mould which is quite important to make this murukku.Back home,i tried this achu murukku before few months, but my first trial was disaster, then i mailed my blogger marathoners to ask how they prepare their mould before making these cookies. They seriously shared wonderful tips and i followed exactly, finally i was able to get my one of my favourite murukkus without any fail. Soak the rice for 3 hours, grind the soaked rice with grated coconut,coconut milk as super fine paste. Transfer this rice batter to a bowl,add the maida, sugar and turn everything as thick batter, the batter should be like dosa batter consistency. It shouldnt be neither liquid nor thick.Adjust the consistency of the batter either by adding the maida or coconut milk if needed. Heat oil in a kadai, once the oil is hot, put the achu murukku mould to the hot oil for a minutes. Take immediately the mould and dip into the batter, the mould should be covered with the batter to 3/4th of the mould. Since the mould is hot,the batter will stick immediately to it and drop gently the batter sticked mould to the hot oil. With a fork, once the batter is half cooked remove the murukku from the mould and cook completely until they get a nice brown colour. Dont forget to sit the mould before dipping the mould to the prepared batter, else your batter wont gets sticks. Namak pare is a famous Indian snack prepared during the festivals, i prepared my savoury bites with homemade barley flour,wheat flour,all purpose flour with ajwain seeds as spicy version. 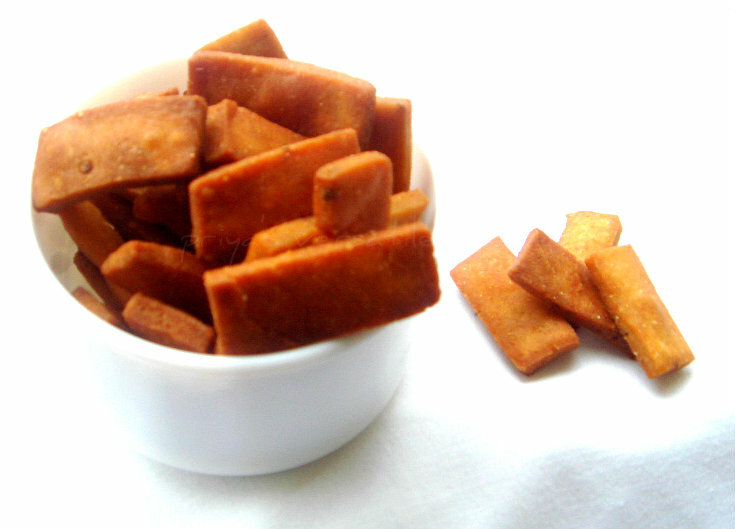 Namak pare, these savoury bites are quite popular in North India eventhough we south Indians prepare them both savoury and sweet version.These savoury bites gets ready in jiffy and they were absolutely addictive, my version of namak pare turned out extremely crispy and we couldnt stop munching. An excellent evening snack, barley flour in this namak pare didnt changed the texture or taste of this crisps.Honestly until you wont say that these savoury bites are prepared with barley and whole wheat flour,none will notice it.You can cut them as diamond cut or as squares but i simply went for rectangular shaped biscuits as my lil one wanted as though. Make this quick savoury bites anytime and they will stay prefect more than a week if they are conserved in air tight containers.Sending to my own event CWS-Barley guest hosted by Roshni. Take together the wheat flour,barley flour,all purpose flour with ajwain seeds,baking soda and red chilly powder in a bowl. Slowly add water to make a stiff dough. Make 3 large balls from the dough and roll out as a large round disc.Meanwhile heat the oil for deepfrying. With a knife,cut them as thin strips and then as rectangule strips. Drop them in hot oil and fry until they turns brown and crispy. Drain the excess of oil with a paper towel and store them in air tight containers. Munch with a cup of coffee. Diwali is just around the corner, am very tempted to see all the beautiful savouries and sweets made by my other blogger buddies sharing since a week in this virtual world. Since this diwali is going to be a working day for us,we wont have much fun this time and i 'll be doing my pooja either before everyone goes or else late in the evening, yep its going to be a usual week day for us. I really miss this festival here, wish i live in India during this wonderful festival of lights.Its going to be almost 18years i didnt celebrated in India,every year i'll console myself that may be next year i'll be in India during this festival, but unfortunately it never happened to me. 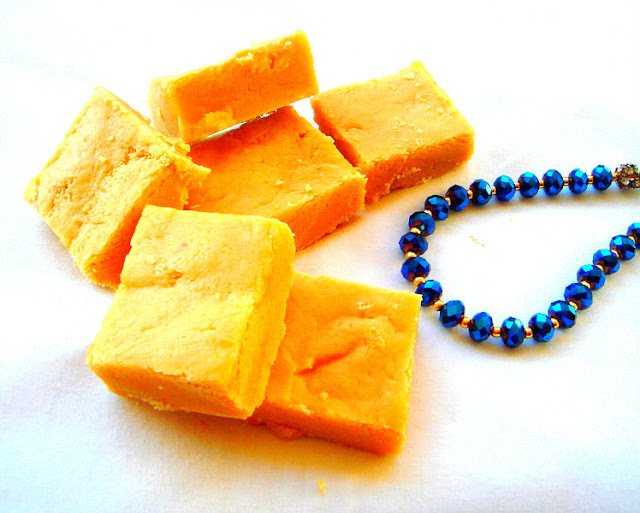 Yesterday i quickly give a trial to this delicious burfi prepared with roasted gram flour and almonds, the outcome was a fantabulous,super soft burfi, we couldnt stop ourselves having them. If you are bored of usual sweets give a try to this irresistible burfis,am damn sure you guys will love it.Sending to 60days of Christmas hosted by Priya and Divya. Dry roast the gram flour until the aroma comes out. Mix the oil to the gram flour and keep aside.This will avoid the lumps while adding the gram flour. Grind the blanched almonds with milk and make a paste. Meanwhile make a sugar syrup with sugar and a half cup of water, sugar syrup must be in one string constitency. Add gradually the thick almond paste, gram flour to the sugar syrup and the ghee to the sugar syrup,stir the mixture until they turns as a dough (at this time this dough will get off from the vessel). Pour this dough over a greased plate, let them cool and cut them as any shape as u desire..
For my third day of blogging marathon, am posting here a low fat version of kofta, prepared with soyachunks and potatoes.Usually koftas are fried either by deepfrying or shallowfrying, being a health conscious person i always goes for baked ones. Since a long,i want to give a try to this low fat version after going through some of my blogger's space.Finally i decided to prepare my koftas through appam pan with few drops of oil and am very satisfied with the final result. Seriously these koftas turned out absolutely prefect with a crispy outer. Everyone at home just loved it simply with ketchup. 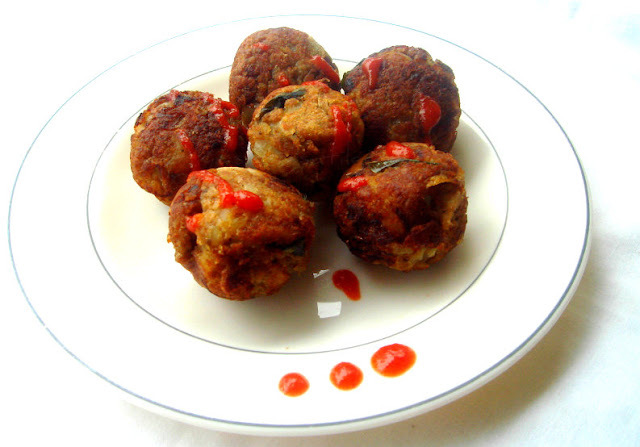 With less oil,this koftas are definitely healthier than the deep fried ones,if you dont like baking this version will definitely helps you a lot. Please get faster your appam pan, if you get a nonstick appam pan you doesnt even need to add those few drops of oil too.Check out the marathoners running this 22nd edition of blogging marathon here.Sending to Kid's Delight-Healthy Makeover guest hosted by Rasi, event by Srivalli. Take the grounded soyachunks,mashed potatoes,chopped chillies,chopped onions,roasted gramflour,salt,garam masala powder and curry leaves together in a bowl. Mix well and make small balls with this mixture. Heat the appam pan,drop few drops of oil. Once the oil is hot,drop gently the already prepared balls to the warm oil,put the flame in medium and cook on both sides until the crust turns brown. 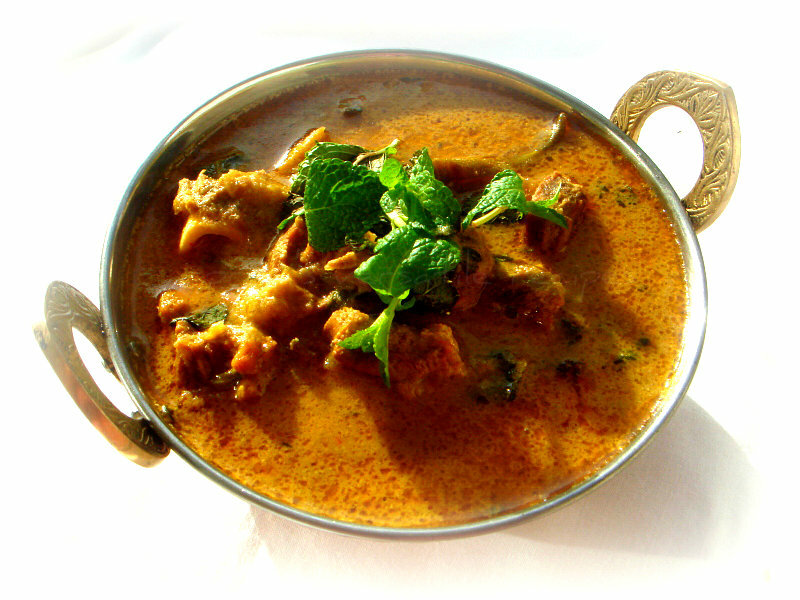 Paneer, the famous Indian cheese is one of our family favourite cheese sinceever we tasted in an Indian restaurant. My fridge will always have a packet of paneer,in case if i forget to pick the storebought ones, i'll make myself at home.Usually i'll freeze homemade paneer cubes for later use as they are really handy to cook as anything whenever we feel like having something with our favourite Indian cheese. Take the yogurt,lemon juice,ginger garlic paste,red chilly powder, garam masala,cumin powder and salt in a bowl. 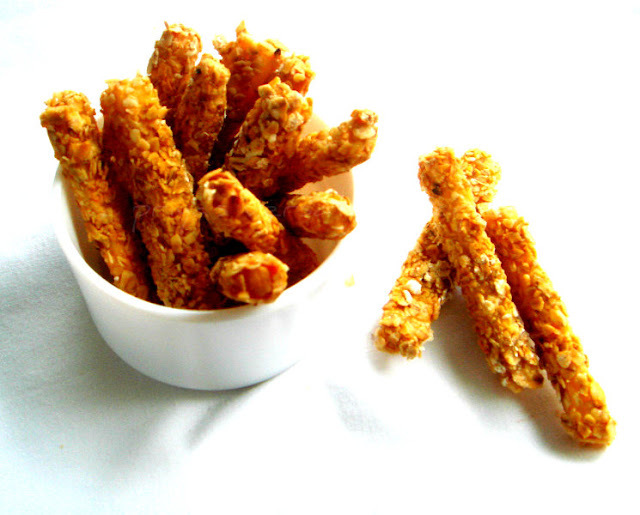 Mix well and dip each paneer fingers in the spice mixture and arrange them in a plate,let them sit for an hour. Make a neither thick nor thin paste with corn flour and water. Now dip each paneer fingers to the cornflour paste and roll immediately to the rolled oats. Preheat the oven to 350F, brush a baking sheet with enough oil lined over a baking tray. Arrange the oats coated paneer fingers over the greased baking sheet and bake for 15-20minutes (dont forget to turn the paneer fingers twice while baking) until the crust turns golden brown. Serve warm with ketchup or sweet chilly sauce.